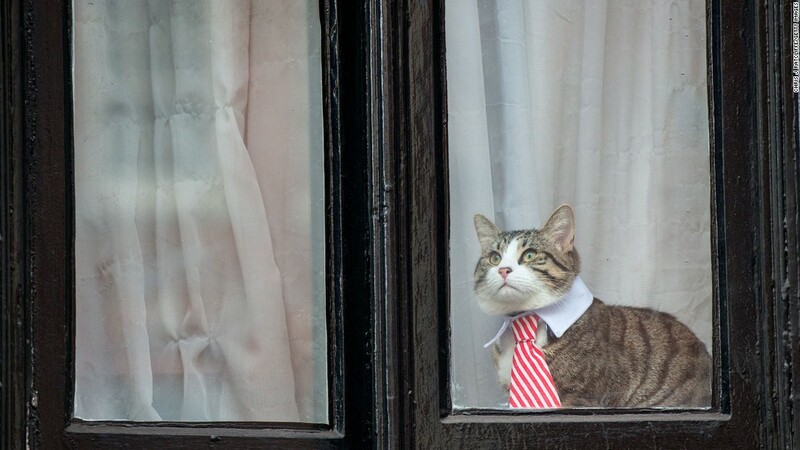 (CNN) Anyone who’s been worried about the status of Julian Assange’s cat can rest easy. WikiLeaks let the cat out of the bag in a video posted to Twitter on Saturday. In the clip, the cat appears to be purrfectly healthy, and can be seen sitting in front of a screen showing footage from Russian-owned video outlet Ruptly of Assange being escorted out of the Ecuadorian Embassy in London. “We can confirm that Assange’s cat is safe. Assange asked his lawyers to rescue him from embassy threats in mid-October. They will be reunited in freedom,” the WikiLeaks post reads. Assange got the cat in 2016 while he was holed up in the Ecuadorian Embassy. The cat became an internet sensation, posing with Assange in photos on Twitter and Instagram under the handle @EmbassyCat. The Twitter account hasn’t been active since 2018, while the Instagram account hasn’t been active since 2017.